Today, the Public Policy Institute of California released two reports that look at how California can better manage the multiple sources of stress to the aquatic ecosystem of the Sacramento-San Joaquin Delta. The reports are part of an ongoing project by researchers at PPIC, UC Davis, Stanford University, and UC Hastings. Aquatic Ecosystem Stressors in the Sacramento-San Joaquin Delta provides a brief overview of the main types of stressors –physical habitat alterations, pollutant discharges disturbances of flow patterns fisheries management, and invasive species. The report then examines potential actions to mitigate their harmful effects on native fish species. Where the Wild Things Aren’t: Making the Delta a Better Place for Native Species presents a long-term vision of a scientifically based “reconciled” Delta ecosystem. The reconciled Delta better supports native species while accommodating continued human use of lands and waters in the watershed. This blog entry summarizes key elements of this vision Further reports on the management of multiple stressors are expected this coming winter. Land and water management within and upstream of the Delta has transformed the Delta into a novel ecosystem with no analogues in the natural world (Lund et al. 2007, 2010; Cloern et al 2011). The “new” Delta continues to change and is a major challenge for water and ecosystem management due to its novel and changing ecological characteristics and the numerous competing and conflicting demands on the ecosystem. In Where the Wild Things Aren’t: Making the Delta a Better Place for Native Species, we focus on the most technically vexing aspect of this problem, and a pre-requisite for effective management – defining and maintaining essential ecosystem functions so populations of endangered or threatened aquatic species will recover to sustainable levels and other native species will continue to thrive. The decline of native fish species that depend on the Delta ecosystem has been a central management challenge for this region for decades, with numerous complications and costs for human users of water and land resources. Improving environmental outcomes is necessary to sustain the local Delta economy and to support more reliable water supplies for regions beyond the Delta. Our vision is guided by the principles of “reconciliation ecology” – a relatively recent approach to ecological management that involves acknowledging and adapting to ecosystem change, rather than just attempting to reverse it (Rosenzweig 2003, Dudgeon et al. 2006, Geisler 2010, Lundholm and Richardson 2010). Such an approach aims to improve conditions for native species, while recognizing that ecosystems are irrevocably altered and will continue to be used to support multiple human goals, and seem widely suitable in California (Hanak, et al. 2011). Our conclusions are informed by discussions with many experts on the ecology of the Delta. 1) Recognition of limits. Natural processes place limits on all water and land management goals. Not all habitats can be created everywhere and not all water resource demands can be met all the time. For example, land elevation is largely destiny, in the sense that elevation largely determines the type and effectiveness for most potential habitat areas. 2) Area specialization. Given the changes the Delta has undergone and the places where native fish currently do best (Figure 1), it is most productive to specialize different parts of the Delta ecosystem for different functions (Figure 2). 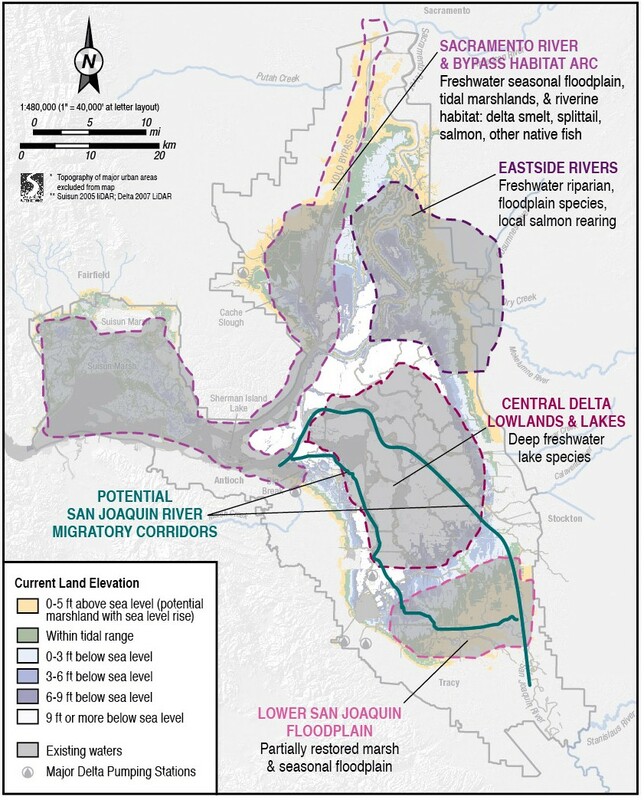 An arc of connected habitats should link Suisun Marsh to the northwestern Delta. Conversely, non-tidal marsh and riparian habitat should be created in the south Delta where tidal ranges are low. Riparian and seasonal floodplain habitat is most appropriate for the eastern and northeastern Delta, where flow and sediment regimes can support them. Some deeply subsided islands in the central Delta are likely to permanently flood, creating deep freshwater ‘lakes’ that will support non-native recreational fish. Despite some conversions of farmland to habitat and the permanent flooding of some islands with low economic value, the Delta would continue to support most urban and agricultural land uses as well as transportation functions (Suddeth et al. 2010; Medellín-Azuara et al. 2012). 3) An expanded toolkit. Levees, channels, and flow management are essential tools, rather than constraints. Using these tools can both help improve conditions in vital habitats and steer native species away from unfavorable conditions. 4) Patience and persistence. It will take decades to achieve biological goals and objectives, and some may prove impossible to achieve, requiring course corrections. 5) Integration and flexibility. All efforts should be based on an integrated – not just coordinated – scientific and adaptive management program. To have the necessary flexibility for future action, this program must not over-negotiate the details up front. One certainty in managing the Delta’s ecosystem is that there will be surprises. Mitigation may be appropriate to help groups that experience direct and significant changes to their livelihoods as a result of these changes, such as those who live and work on lands that are appropriate for habitat development or likely to permanently flood. Ecological investments in the Delta will ultimately benefit California’s economy by securing higher-quality, more reliable water for agriculture and urban use, averting expensive responses to natural disasters, and expanding recreational opportunities. Ecosystem and economic objectives are mutually dependent. Laying out a strategic direction that recognizes this interdependence is necessary to guide effective plans and policies among the many state, federal, and local entities involved in Delta water, land, infrastructure, and ecosystem management. Dudgeon, D., A. H. Arthington, M. O. Gessner, Z-I. Kawabata, D. J. Knowler, C. Lévêque, R. J. Naiman, A-H. Prieur-Richard, D. Soto, M. L. J. Stiassny, and C. A. Sullivan. 2006. “Freshwater Biodiversity: Importance, Threats, Status and Conservation Challenges.” Biological Reviews 81: 163–82. Geisler, C. 2010. “Must Biodiversity Hot-Spots Be Social Not-Spots? Win-Win Ecology as Sustainable Social Policy.” Consilience: The Journal of Sustainable Development 4 (1): 119–33. Lund, J., E. Hanak, W. Fleenor, R. Howitt, J. Mount, and P. Moyle. 2007. Envisioning Futures for the Sacramento–San Joaquin Delta. San Francisco: Public Policy Institute of California. Lund, J., E. Hanak, W. Fleenor, W. Bennett, R. Howitt, J. Mount, and P. Moyle. 2010. 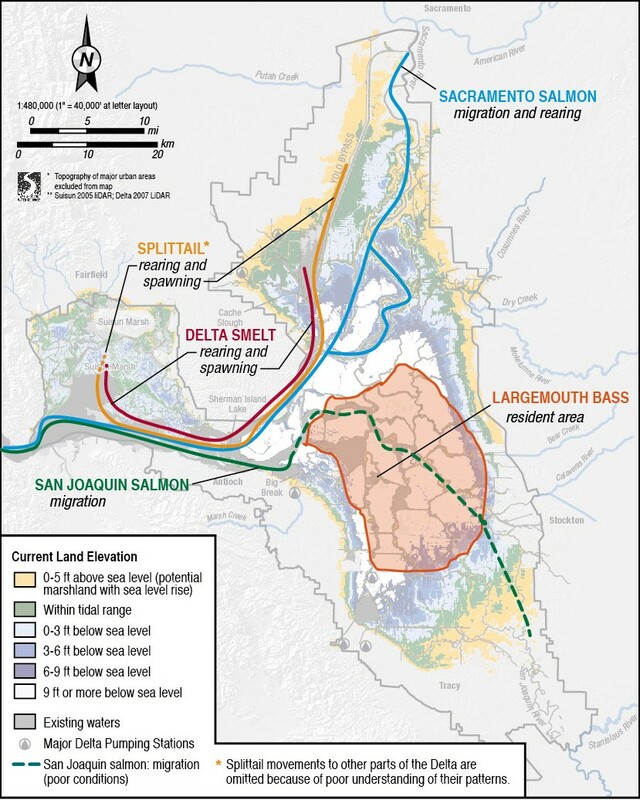 Comparing Futures for the Sacramento–San Joaquin Delta. Berkeley: University of California Press and Public Policy Institute of California. Lundholm, J. T., and P. J. Richardson. 2010. “Habitat Analogues for Reconciliation Ecology in Urban and Industrial Environments.” Journal of Applied Ecology 47: 966–75. Medellín-Azuara, J., E. Hanak, R. Howitt, and J. Lund. 2012. “Transitions for the Delta Economy.” San Francisco: Public Policy Institute of California. Mount, J., W. Bennett, J. Durand, W. Fleenor, E. Hanak, J. Lund, and P. Moyle. 2012. “Aquatic Ecosystem Stressors in the Sacramento–San Joaquin Delta.” San Francisco: Public Policy Institute of California. Suddeth, R., J.F. Mount, and J.R. Lund. 2010. “Levee Decisions and Sustainability for the Sacramento San Joaquin Delta.” San Francisco Estuary and Watershed Science 8 (2). This entry was posted in Biology, Fish, reconciliation, Sacramento-San Joaquin Delta, Stressors and tagged Delta, Ellen Hanak Brian Gray, Jay Lund, Jeffrey Mount, John Durand, native fish, Peter Moyle, Public Policy Institute of California, Sacramento-San Joaquin Delta, UC Davis Center for Watershed Sciences, William Bennett, William Fleenor. Bookmark the permalink.